Our engineers are currently available throughout the country. Our DVD and CD Recording and Production package includes : Up to two hours of on-location digital stereo and video recording, eight hours of studio post production, and 3 hours of full-color packaging designed by our in-house graphic artist (includes program, students names, and photo, if provided), CD and DVD-duplication, fund-raising order forms and materials, three complimentary CDs and DVDs each, and very importantly, the processing and payment of mechanical licenses for all copyrighted materials performed on your album. Simply choose your delivery method (Program 1 or Program 2) or combine these two programs to have discounted bulk sales for your group and sales directly to your patrons at your concert. For CD Program click here! PROGRAM 1: You purchase DVDs & CDs and sell them, with our help, to your patrons. Place your order with Soundwaves after you have determined the total amount of sales and order only the amount you need. At least 50% of your order must be DVDs. We can provide sales forms, on-line ordering (see example here), and our sales contest, to help you reach your goals. See pricing in chart below. Program 1 is Recording is FREE for orders of 100 or more DVDs, CDs, or CD/DVD sets. Sets are counted as one sale. Your profits begin with sales of 100 total units. PROGRAM 2: Soundwaves sells & mails directly to your patrons. Have Soundwaves take orders at your concert and mail the CDs $ DVDs directly to your patrons. No money is collected at the concert; invoices and products will be sent individually to those who order. Cost is $20.00 per CD, $35 per DVD and $45 for DVD/CD set, plus $5 shipping for orders of any quantity. Program 2 is also No recording fee for orders of 100 or more CDs and/or DVDs (any combination)! Compilation Recordings - Your recording can be a compilation of two or more concerts or sessions to produce a “best of” or “audio yearbook” collection of the year’s recordings. Extra Sessions - Extra two hour recording sessions including studio edit & mastering and sample CD are $725. Multi-track recording - Excellent for large ensembles. More channels gives our engineers more options when creating the final mix. Up to 16 trks add $150 / 24 trks add $200. Reorders Always available. Add reorder quantity to your original order quantity to find your accumulated total, then see chart above to find your new and possibly lower price for CD and DVD reorders. Double CD or DVD add $5.00 for each CD. For over 20 years Soundwaves has been an industry leader in promoting, obtaining and paying all mechanical licenses as required by law when recording copyrighted material. We keep the process legal, protecting you from copyright violations that occur when making CDs without obtaining licenses. TEACHING and AUDITION TOOL - Your CD and/or DVD can be a great teaching tool. You and your students can listen to and analyze your own performances. They'll be able to hear the subtleties of tone, balance, and other musical principles you've been teaching. The process of professionally recording your group with Soundwaves can elevate the caliber of your members’ musicianship, enhance their confidence and self-esteem, and add excitement to their music studies. You can use your great sounding audio for auditions or to enter contests or auditions for conferences, etc. 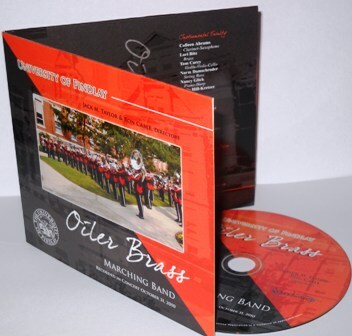 PROFESSIONAL GRAPHICS - Our in-house graphics artist will design and layout your CD and/or DVD packaging. We can take care of the design completely or work from a program, photo or artwork supplied by you. All CDs and/or DVDs have direct on-disc printing and 4-panel full cardboard wallets. Proofs can be emailed to you for approval or editing at no charge. EASY FUND-RAISING PROGRAM - Your CDs and/or DVDs can serve as a new and easy fund-raiser.Unlike other fund-raisers, it is not necessary for each member to sell dozens of items. Your group can generate profits with just one, two, or three sales per member! To promote sales, we supply customized order forms referring to your specific fundraising need. Soundwaves also provides cash awards to top sellers. NO UNSOLD CDS! - We will help you maximize sales in several ways. Place your order after you determine your group's total sales. Order only the amount you need, no “left overs” (30 minimum). NO UPFRONT COSTS! - Purchase only what you pre-sell, no payment until delivery. LIFE-LONG KEEPSAKE - You will be creating a lifetime keepsake for your members and their families. You and your members have worked hard preparing pieces for your choir or band performance. We can capture your music in a pristine quality recording that will raise funds for your group and be a life-long keepsake for you, your members and your audiences.